Five Fantastic Farm Frenzy Favorites! 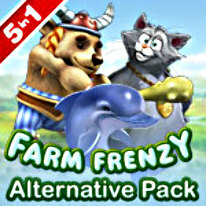 Get five fantastic Farm Frenzy games in one download! Raise animals, grow your farm, and produce essential goods in this quintet of exciting time management games. This pack includes the following games; Farm Frenzy: Gone Fishing, Farm Frenzy: Ancient Rome, Farm Frenzy: Viking Heroes, Farm Frenzy 4, and Farm Frenzy: Hurricane Season. With hundreds of exciting levels, vivid art and animation, and bonus features galore, the Farm Frenzy Alternative Pack will enthrall you for hours upon hours.